“Rule, Britannia! Rule the waves!” This was the patriotic chant of the British Royal Navy when the British Empire was taking shape. That naval power was the force that enabled Britain to rise to world dominance 250 years ago. 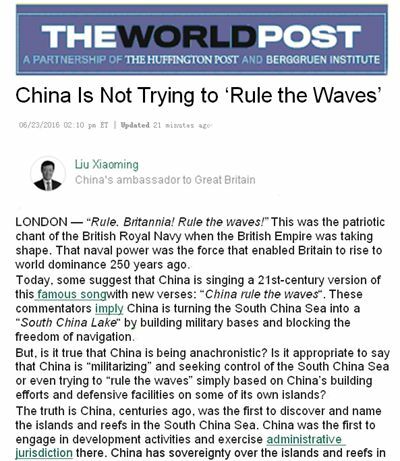 Today, some suggest that China is singing a 21st-century version of this famous song with new verses: “China rule the waves”. These commentators imply China is turning the South China Sea into a “South China Lake” by building military bases and blocking the freedom of navigation. But, is it true that China is being anachronistic? Is it appropriate to say that China is “militarizing” and seeking control of the South China Sea or even trying to “rule the waves” simply based on China’s building efforts and defensive facilities on some of its own islands? The truth is China, centuries ago, was the first to discover and name the islands and reefs in the South China Sea. China was the first to engage in development activities and exercise administrative jurisdiction there. China has sovereignty over the islands and reefs in the South China Sea but is in control of only a few since over 40 of them have been occupied over the recent decades by other littoral states including Vietnam and the Phillipines, who since their occupation have been reclaiming lands and building facilities in order to reinforce their control. Meanwhile, on most of the islands and reefs under China’s control, living conditions are tough – apart from the Taiping island which is stationed by Taiwan. Faced with the serious and increasing imbalance in the South China Sea, China as the real owner of the islands and reefs needs visible presence to reaffirm its sovereignty. In a sense, this is an effort of “rebalancing” in the South China Sea. After all, one has to be realistic in international politics and diplomatic negotiations. It is always difficult for property owners to evict squatters. Necessary as it is to keep self-restraint, non-action is never an answer to opportunism by intruders. Therefore, China’s increased presence in the South China Sea is not to “rule the waves”. China claims sovereignty and historical rights over the islands and reefs in the South China Sea. This is not a claim on the entire South China Sea, still less turning it into a “China Lake”. As the South China Sea is a primary international shipping route, China will never impede lawful and legitimate freedom of navigation. The real danger comes from countries outside the region, who invent pretexts for provocative military actions in the South China Sea in order to force China to step up defense in response and to trap China into a “self-fulfilling prophecy”. In this externally imposed game, China is not holding the on-off button but rather apparently has been reacting to provocations. Another factor stoking up the tension is that a handful of countries in the region feel they have strong backing. The reality in the South China Sea is not China bullying smaller neighbours. The reality is that China is being bullied by smaller neighbours. A typical example is the arbitration initiated by the Philippines who think they have the backing of bigger country. But little do they know that they are nothing more than the pieces on the chess board of the superpower that may one day run out of their usefulness. In Asia, superpowers are used to coming and going. One needs to look no further than Cam Ranh Bay and Subic Bay. The issue of the South China Sea is a test of China’s diplomatic wisdom and strategic consistency. China needs to firmly uphold its sovereignty while exercising a high-level of self-restraint. The last thing China wants is to be dragged into armed conflicts. Nor will China accept any arbitration forced onto it by others. But the South China Sea issue is not insoluble. From the very beginning China put forward the proposition of shelving disputes and engaging in joint dialogue and development. This basic principle remains unchanged. As a realistic solution, China has proposed the “dual-track approach”, that is, relevant disputes should be properly resolved through negotiation and consultation by countries directly involved. This approach is based on historical facts and the international law, so that the peace and the stability in the South China Sea should be jointly safeguarded by China and member countries of ASEAN. The issue of the South China Sea is a touchstone for all relevant countries. We hope that some countries in this region will not force ahead in their own way to intensify conflicts at the cost of regional cooperation. We hope that they can work with China to effectively manage differences, safeguard stability and explore a new model of cooperation. As for any country outside the region, it is crucial for them to desist from provocative actions; such as pitching one country against another or increasing forward military deployment in this region. We hope that nations outside the region could be impartial, take no sides and support China’s efforts to resolve the disputes through bilateral negotiations with countries directly involved. The world today is not going to repeat the colonial expansion of the 17th and 18th centuries, the conflicts between European powers in late 19th century, or the Cold War years. China is a peace-loving nation with a profound understanding of the lessons about the rise and fall of great powers. China does not have the tradition of seeking hegemony. Nor is China interested or motivated to do so. The path that China will continue to follow is a path of peaceful development.